Reservoir’s sky rail: Solution or disaster? Should Reservoir residents be questioning plans for elevated rail at the High Street level crossing? Reservoir’s High Street level crossing is a tangle of Spring Street, High Street and Cheddar Road, all merging into a myriad of madness where 36,000 cars cross the Mernda line tracks every day. With its boom gates down for 24 minutes of the two-hour morning peak period, it’s no wonder the location has been labelled the third-worse level crossing in the whole of Melbourne. All that is about to change though, with the Level Crossing Removal Authority announcing plans to construct a new rail bridge option over High Street and a revamped Reservoir station, closely mirroring the sky rail construction in Melbourne’s southern suburbs. With work due to start in 2019, the dream of a seamless run through High Street onto Spring Road is moving closer to realisation. Yet some members of the wider Melbourne community fear that the short-term benefits of Reservoir’s level crossing removal may be outweighed by the long-term effects. These effects have already been felt in areas where sky rail has been erected instead of constructing below ground trenches or underground tunnels. Dianne Hunt, who campaigns for the Lower Our Tracks group, told upstart that sky rail has been a disaster along the Cranbourne/ Pakenham line. “I think it’s a very poor solution,” she said. “We are finding out more and more that it’s actually a very expensive alternative, and the government has refused to disclose the report on exactly what it is costing before the elections. “We’ve had reports it could be anywhere between up to $4 billion, which is nearly $3 billion more than the estimates. Hunt says her personal experiences with sky rail should act as a warning to Reservoir residents who are willing to accept elevated rail in the area. Living no more than 100 metres away from a now elevated railway line, Hunt claims she can hear trains more clearly than when the tracks were at ground level. “While it’s quieter right next to the line, it is so much louder further away from the line,” she said. Real estate agents warned of lower property values in areas which were to be affected by the construction and completion of sky rail projects. Hunt says those warnings have come to fruition, claiming house values have almost dipped by a third of their original value. “I could never hear the trains at night and now it just sounds like they’re right outside my bedroom window,” she said. With 20,000 people from the Bayside area having signed a petition against level crossings, it begs the question of what the reaction will be from Reservoir residents when construction eventually starts. However, Darebin City Council Mayor Kim Le Cerf believes the removal of the congestion caused by the High Street level crossing will be the most important gain of the proposed sky rail alternative. With the decision to build an elevated rail made by the Victorian Government’s Level Crossing Removal Authority, Le Cerf told upstart that the Darebin City Council were open to the either the above or below ground rail option. Le Cerf believes members of the local community will agree with the council’s view that an elevated sky rail option will be better than the current infrastructure. “The removal of the level crossing at high street will go a long way to helping resolve the traffic congestion,” she said. Dianne Hunt claims that the Lower Our Tracks group have allegedly received reports from local police saying they were now aware of increased crime in the areas under elevated rail. However Le Cerf says the council will work with planners and local police to ensure the new underpasses and Reservoir station will be a safe place for the community. “I haven’t heard those statistics, I think one of the things we’d be advocating for is any design that helps with the prevention of crime,” she said. With site establishment and geotechnical investigations underway at the High Street level crossing site, it won’t be long until an elevated rail structure adorns the Reservoir skyline. And even though plans have been laid and construction is imminent, Hunt has two bits of advice for residents who will find their homes situated near the project. “I would say question it,” she said. 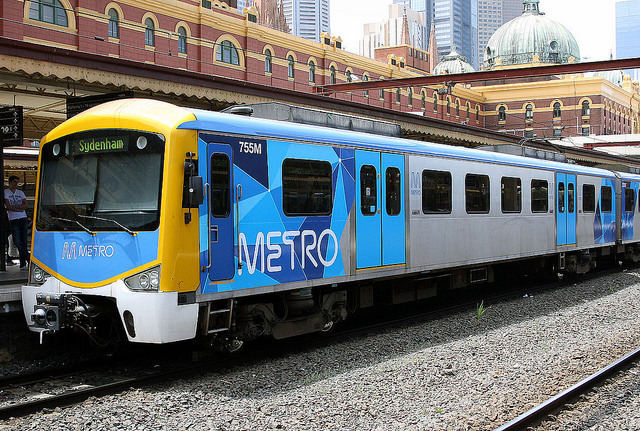 Photo: Melbourne Metro By Zed Fitzhume available here and used under a Creative Commons Attribution.